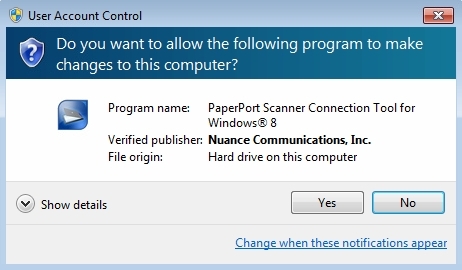 You may want to click the Yes button to put a shortcut to it on your desktop to make it easier to run if you need the tool again (you should run it again if you reinstall, upgrade, or repair PP14; or if you install new or upgraded scanner drivers). I had it create the shortcut, although I like a very clean desktop, so I moved the shortcut off the desktop and into the PP14 program group. A note to confirm that this tool is effective with Windows 7 as well. I couldn't access Capture Assistant at first and the Tool fixed that. Although Nuance says that it is exclusively for users of Windows 8, several people have found that it can also mend scanner issues with earlier versions of Windows. 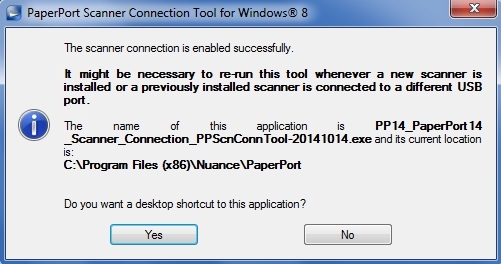 So, if you're having problems scanning in PP14 with W7, W8, or W10, this tool is worth a try. If you do find that it solves your PP14 scanning problem, please add a comment to this article with your version of Windows and what the problem was that this tool fixed. This will be a great aid to other members.